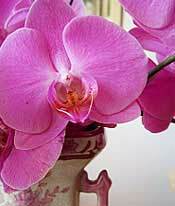 A single spike of the superb Phalaenopsis is an enchanting melodyelegant, refined, pure. 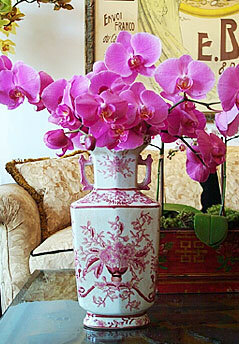 A dozen brilliant fuchsia blooms is a symphony of floral color and form, accompanied here by a glorious hand-painted floral porcelain chinoiserie vase of ivory and rose . Let Beautiful Orchids bring this masterpiece directly to your doorstep and enjoy the virtuosity of an orchid arrangement in your own home. Get them while they're in bloomthe season is limited. 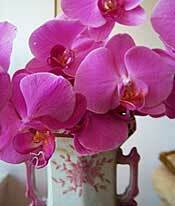 The arrangement above was created with 12 perfect stems of freshly cut Phalaenopsis in our chinoserie vase. Each purchase includes care instructions and an exquisite gift card for your personal message. Each stem is approximately 10-13 inches tall bearing 4-6 blooms and comes with individual water vials. The flowers measure approximately 3.5-4.5 inches in diameter.